The Fluke 922 airflow meter and micromanometer makes airflow measurements easy by combining pressure, air flow, and velocity into a single, rugged meter. Compatible with most pitot tubes, Fluke 922 airflow meters and micromanometers allow technicians to conveniently enter their duct shape and dimensions for maximum measurement accuracy. The Fluke 922 airflow meter and micromanometer is a powerful meter which provides differential and static pressure, air velocity and flow readings. The rugged design is built for field making the meter easy to use without sacrificing performance. Features of the Fluke 922 airflow meter and micromanometer include a user-defined duct shape and size functionality for maximum airflow accuracy. 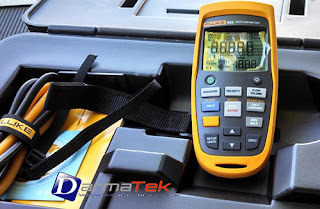 Fluke 922 airflow meters and micromanometers have conveniently colored hoses which help properly diagnose pressure readings. The bright, backlit display allows for clear viewing in all environments. The Fluke 922 airflow meter and micromanometer has Min/ Max/ Average/ Hold functions for easy data analysis. The auto power off function saves battery life. • Differential and static pressure, air velocity and flow readings. • Coloured hoses help proper interpretation of pressure readings. • User-defined duct shape and size for maximum airflow accuracy. • Resolution down to 0.001 in H2O. • Min/ Max/ Average/ Hold functions. • Data storage capacity: 99 readings. • Auto power off saves battery life. • Size ( HxWxD) : 17.5 x 7.75 x 4.19cm.